Blonde. Auburn. Red. Dishwater blonde. Golden brown. Ash brown. Soft black. Dirty Blonde. 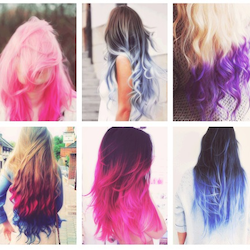 Stop for a minute and think about the many hair colors that are all around you. There is such variety of shades and textures. It’s a stereotype to think women are the only gender to care about hair colors; both men and women consider hair color often. For instance, if a woman is not talking about her own hair color, she is probably describing someone else’s. If a man no longer has a full head of luscious locks, it doesn’t stop him from admiring the hair clad people around him. Hair color is, whether conscious or not, something we observe often. Now, two engineers want to have entrepreneurs and investors think about hair color in new ways. What if you could permanently change your hair color by simply using a flat iron? Mechanical engineers from The University of New Mexico, Bruce C. Lamartine and Zayd C. Leseman are exploring the idea of “Nano-Patterning of Diffraction Gratings on Human Hair for Cosmetic Purpose.” In other words, they are seeking to find a way to re-pattern a single strand of hair so that it reflects a different color. The use of focused ion beam technologies and the way they can be used to pattern different materials. Their research explores a way to etch diffraction gratings on individual hairs to reflect light in a specific way. Unlike out-of-a-box hair dyes and creams, pattern etching human hair would provide permanent results. (Unfortunately, the article doesn’t say if the process can color gray hair.) Without applying a special conditioner to the hair, the new color would be a lifelong commitment. News of this experiment couldn’t come at a better time. Hollywood seems obsessed with changing their hair color. But they’re looking for anything besides brunette, blonde, or auburn. Media darlings Ke$ha, Nicole Richie, Kylie Jenner, Katy Perry, and Anna Paquin recently sported blue-dos (http://news.instyle.com/2014/07/24/kesha-blue-hair-tips-photo/). Celebrities may be accustomed to getting media coverage for changing their hair color, but it’s far less likely that two engineers would dedicate time and energy to discovering a new, improved, and permanent way to alter a person’s appearance. And the University of New Mexico professors are the first to say that haircare isn’t the only thing this process is good for. While altering hair color seems to be the most marketable use for the scientific experiment, this discovery may serve additional purposes. Read more about how nano-patterning of diffraction gratings may prevent credit card theft and improve national security: http://news.unm.edu/news/new-technology-allows-hair-to-reflect-almost-any-color. Currently, Lamartine and Leseman are eager to find funding for their research. If news of a permanent solution to change hair color makes it to celebrities, or if the process can miraculously eliminate grays, it seems chances of funding would be rather high. This entry was posted in "out of the box" art, engineers, Hair Color, science, Technology in art and tagged celebrities, color, engineers, hair color, hair color craze, hair dye, hair styles, hairdos, permanent hair color, science, technology, University of New Mexico on August 28, 2014 by segmation. SO MUCH OF MY MCS & OTHER HEALTH PROBLEMS GO BACK TO ME BEING A COSMETOLOGIST– & ALSO SPECIALIZING IN PERMANENT HAIR COLOR!! AND I USE TO CHANGE THE COLOR OF MY HAIR LIKE MY UNDER-WARE– BOY HAVE I PAID FOR THAT!!! WHEN THE HAIR COLOR COMPANIES SAID ALL THE PRODUCTS WE USED WERE SAFE– THEY WERE NOT!!!!!! AND I KNOW HUNDREDS OF PEOPLE WHO ARE PAYING FOR IT WITH MCS & OTHER HEALTH PROBLEMS!!! Good job, creative, keep posted please. Anyway, even though not truly permanent, this would be really cool technology if it were possible!